Description: Send someone a sure-to-be-appreciated surprise this holiday season with the Holiday Chameleon 15 box. Filled with fifteen of our most requested recipes arranged in a traditional chestnut wood box, it’s an unforgettable way to share the rustic charm of a French countryside Christmas with those you love. Description: Four of our favorite recipes are dazzlingly decorated with 8 leaves of edible 24-karat gold to create the Opal Gold, making it an unexpected opportunity to experience bite-sized chocolate bliss. Complete with a slow-roasted hazelnut-almond praline (number 0), a lavender-infused vanilla ganache (number 1), a delectable Italian gianduja praline (number 2), and our unmistakable Z chocolate with its crunchy praline layer running parallel to a sweet-salty caramel layer, the Opal is a sample-sized exploration of our most exceptional recipes. 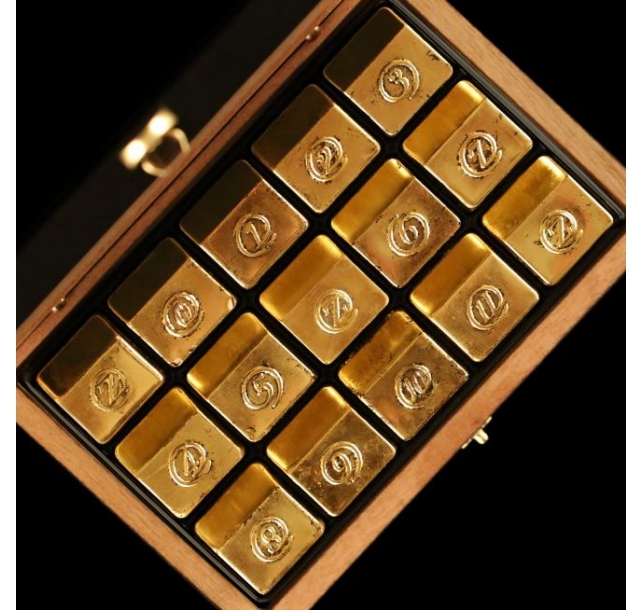 Description: A fantastic fusion of sophistication and flavor, the Sapphire Gold features every recipe from the Traditional assortment glamorously gilded with a combined total of 28 leaves of edible gold and presented in a black mahogany box. 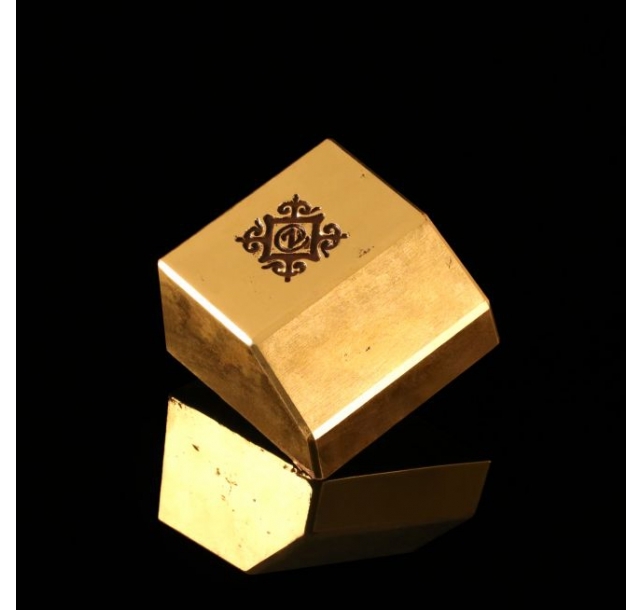 With pure gold adorning the outside of each chocolate, and chef-inspired flavors like raspberry ganache and Valencia almond-studded praline on the inside, it’s a Midas-worthy gift for anyone who appreciates the finer things in life. 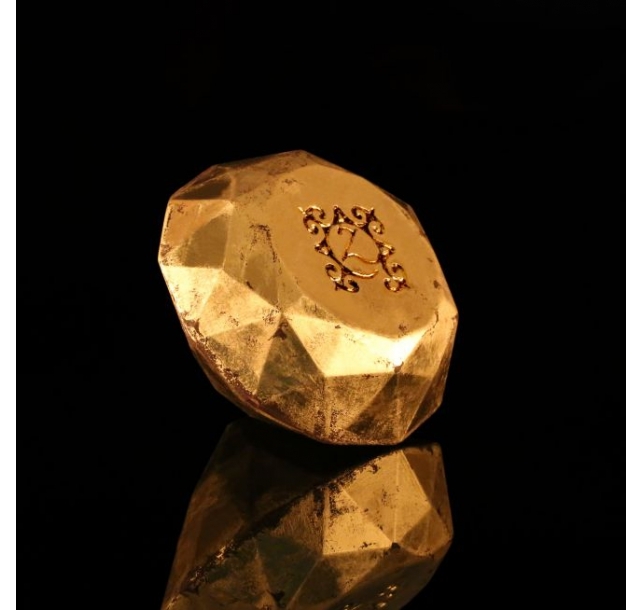 Description: The crown jewel of our confectionary recipes, the Precious Gold is a decidedly dazzling diamond of pure edible indulgence. 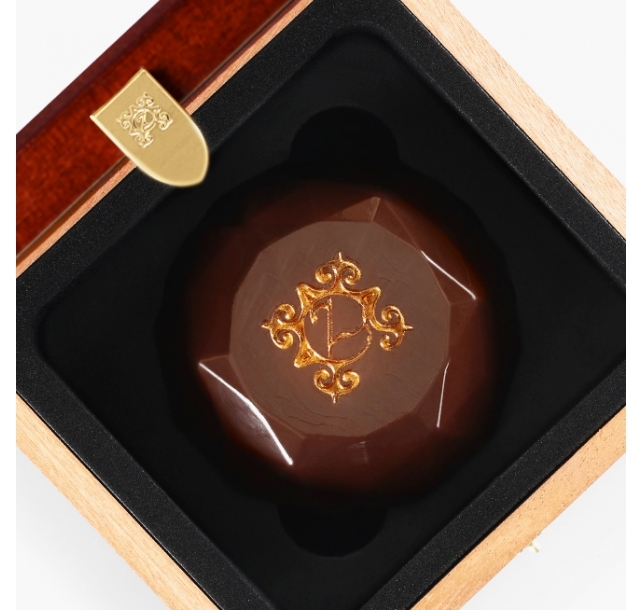 Gilded with 17 leaves of 24-karat gold, this unusual confection features praline-enshrined caramelized Piedmont hazelnuts with a layer of sweet 40% Ivory Coast milk chocolate and a coat of intense 70% Venezuelan dark chocolate couverture. 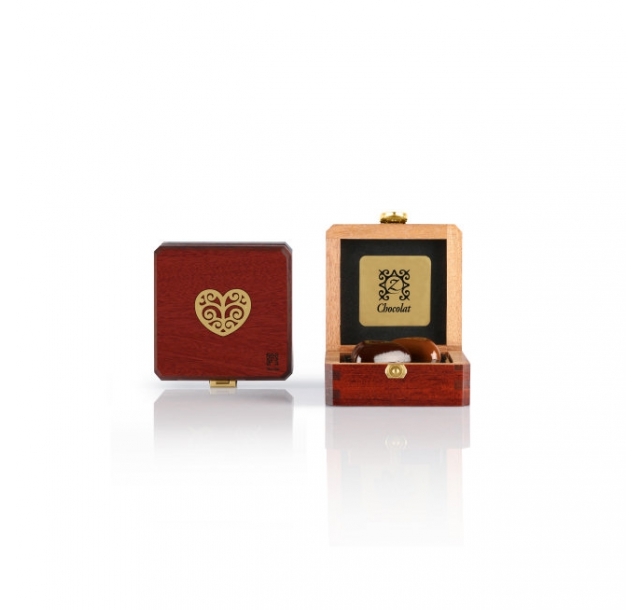 Appropriately packaged in a jewelry-worthy black-finish mahogany chest, the Precious is a memorable way to let someone know they are your one and only. Description: A hopelessly romantic half-pound monument to undying devotion, My Heart Gold is a sumptuous assertion that love conquers all. 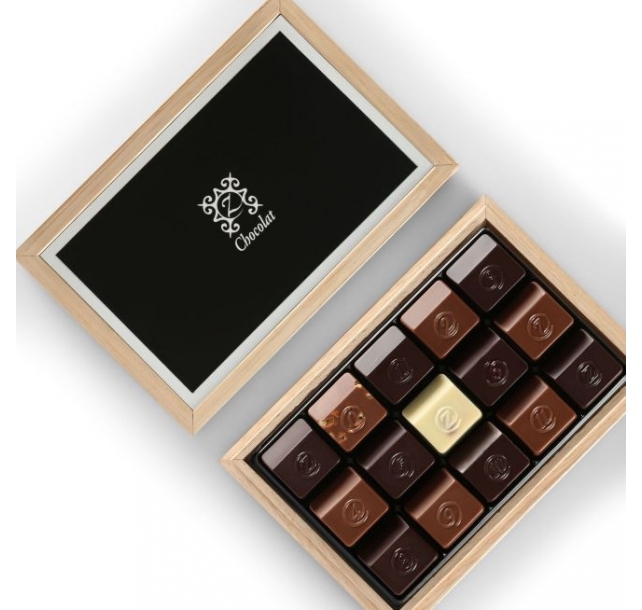 With an exterior made of 22 leaves of 24-karat gold over smooth 70% Venezuelan dark chocolate, and an interior of silky 40% Ivory Coast milk chocolate plus caramelized Piedmont hazelnut-studded praline, it’s a passion-inspiring example of culinary perfection. 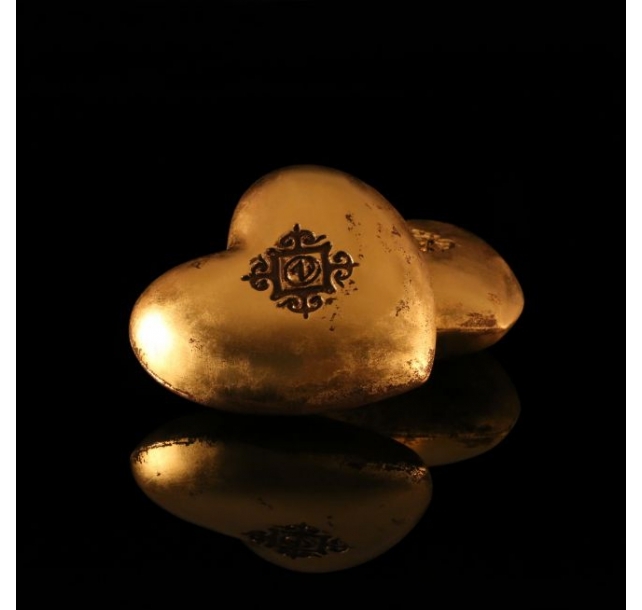 Luxuriously packaged in a black mahogany box, the My Heart is an unforgettable ode to endless romance. 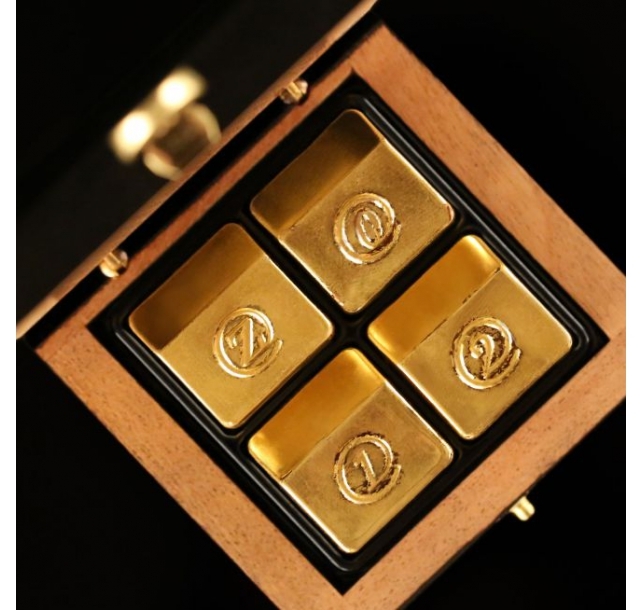 Description: Experience 3/4 pounds of shimmering chocolate ecstasy with the Large Z Gold. 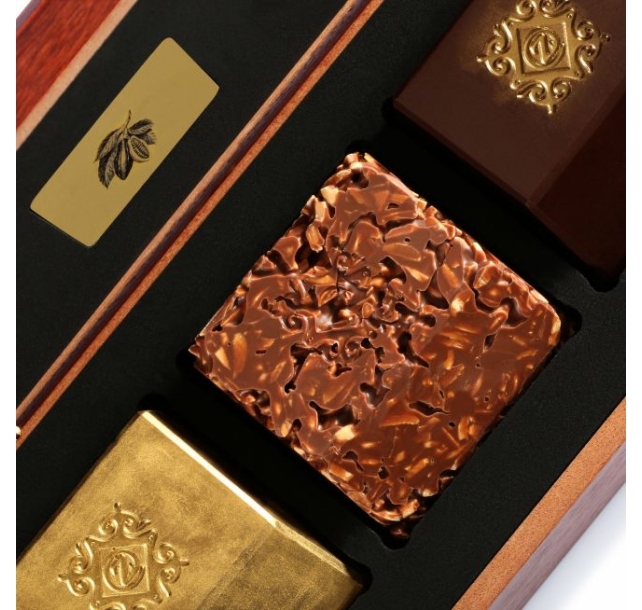 Featuring a rare 2008-vintage dark Bolivian cocoa couverture decorated with 18 leaves of genuine 24-karat food-grade gold, and a center of slow-roasted whole-caramelized Piedmont hazelnuts contained in velvety praline and topped with a layer of salty Madagascar vanilla caramel, it’s an astounding example of edible art and the perfect way to pamper someone special. 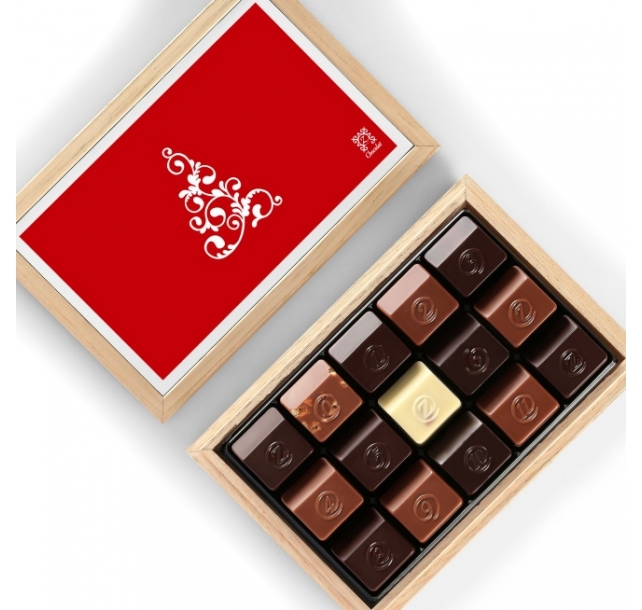 Description: Give away the key to your heart with a delicious 12-piece chocolate heart assortment transpiring passion and fantasy as it reveals the Toquade: a delicious dark ganache cloaked in a white exterior, the Suprême: a creamy milk hazelnut praliné, the Mystique: a Vanilla Bourbon caramel dressed in a dark couverture and the Amore: a divine bergamote-infused ganache hidden under a daring red robe – all presented in a chic and modern zBox emblazoned with your precious key. 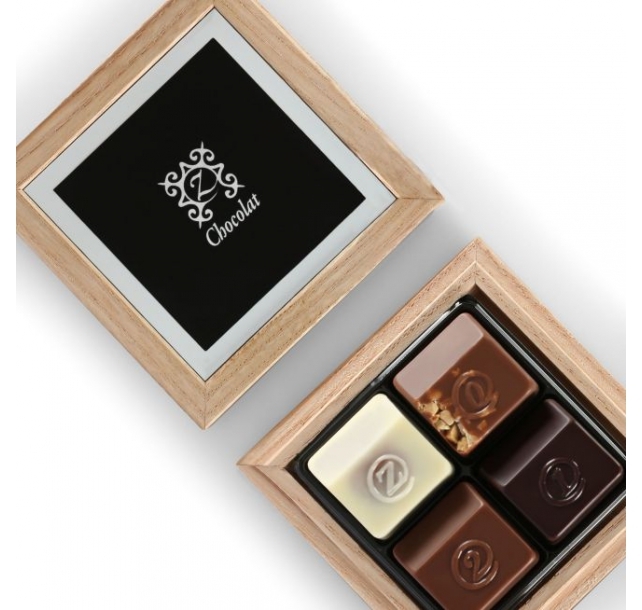 Description: Experience the entire symphony of zChocolat flavors in a single stunning product. Known simply as Rainbow, it’s the only product that brings together all sixteen of our classic assortments in one place, making it an unparalleled celebration of zChocolat goodness. Presented as two mini-boxes, Rainbow comes packaged in a pair of beautiful basswood boxes. First, explore the Chocolats box. A complete set of our famous chocolate assortments, it’s an invitation to indulge in eight different arrangements of our trademark recipes, ranging from the classic to the unexpected. After that, delve into the Douceurs box. 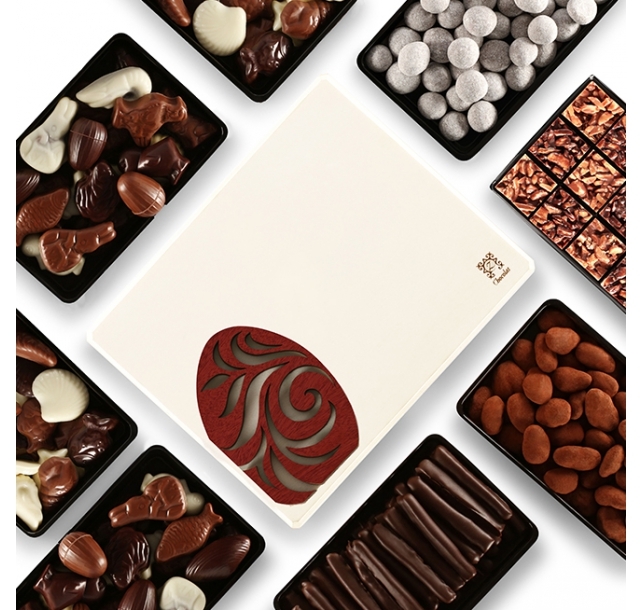 From our decadent Chocamandines to our playful Pépites it’s the definitive way to explore all of our signature sweets. Description: As luminous as its name, the Easter Radiance features a beautiful basswood box positively bursting with the best in fine French chocolate. Not only does it include 4 assortment-sized cartons of our signature Easter recipes for an astounding total of 72 solid chocolates and 36 hazelnut pralines, but it also includes 4 additional assortment boxes replete with a variety of rich chocolate candies including Pépites, Noisettines, Chocamandines, and Orangettes. A truly luxurious way to welcome spring. 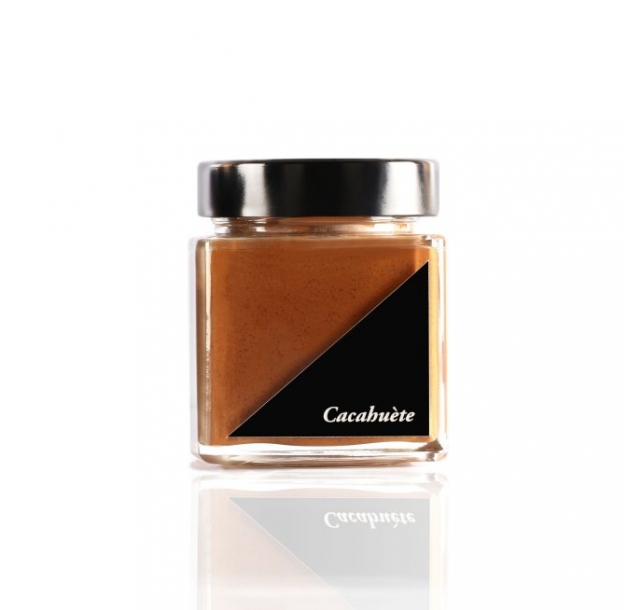 Description: This succulent spread is made with toasted Valencia almonds, which are caramelized and combined with velvety 40% Ivory Coast milk chocolate. 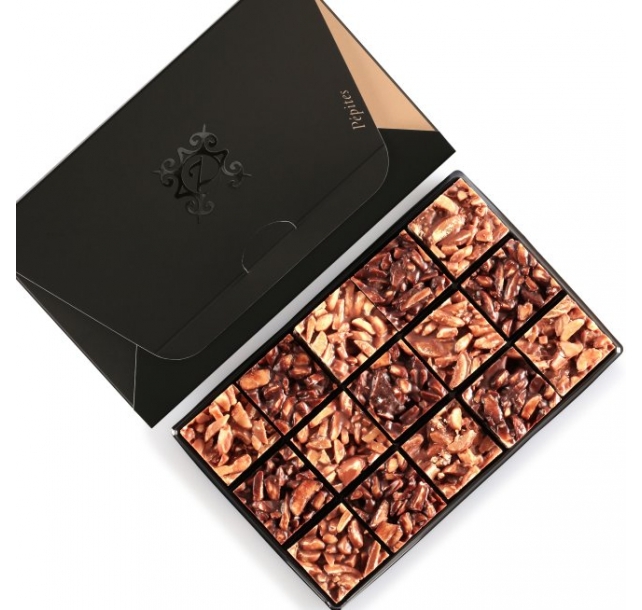 Caramelized almonds bits are melded into the mix to add a delightful crunch. 54% almonds, 25% chocolate for only 21% sugar. Description: The chic and modern styling of the zBox 15 laden with our traditional assortment makes this ultra-elegant gourmet box a 'must-have' to celebrate the arrival of 2017. Description: The chic and modern styling of the zBox 45 laden with an epicurean selection of the finest French chocolates makes this ultra-elegant gourmet box a 'must-have' to celebrate the arrival of 2017. Description: To create the most indulgent peanut spread, we slow-roast and caramelize peanuts from China, then mix them with toasted almonds from Valencia and smooth 40% Ivory Coast milk chocolate for an enchanting treat. 34% chocolate, 29% almonds, 21% peanuts for only 16% sugar. Description: Show thanks to the moon by bestowing a gift of appreciation as this sophisticated polished Mid-Autumn mahogany box is graced with our entire Numbered Collection. The inside plate is adorned by a symbolic Vietnamese image representing 'the lady of the moon'. Description: Grace someone with a celestial gift worthy of the season by offering our Mid-Autumn Ruby. This sophisticated polished mahogany box is designed to thank the moon with the special mainstay symbol of lanterns. Containing our entire Numbered Collection, your recipients are in for a harvest of smiles! Description: Valencia almonds are roasted and chopped before being drowned in either 70% Venezuelan or 40% Ivory Coast milk chocolate to make these intriguing treats. A mouthwatering combination of smooth and crunchy textures, you'll want to keep several boxes on hand for whenever cravings strike.